My wife and I wondered if Norwegian’s concept of Freestyle Cruising might be for us. We were not quite sure what to expect since neither one of us had ever sailed with Norwegian before, though expectations of our cruise kept rising until embarkation day, as fellow-cruisers we talked to consistently told us “You will like it” and “You will sail with them again.” With Roatán, the cruise line’s private island of Harvest Caye, as well as Costa Maya and Cozumel, the itinerary was promising. 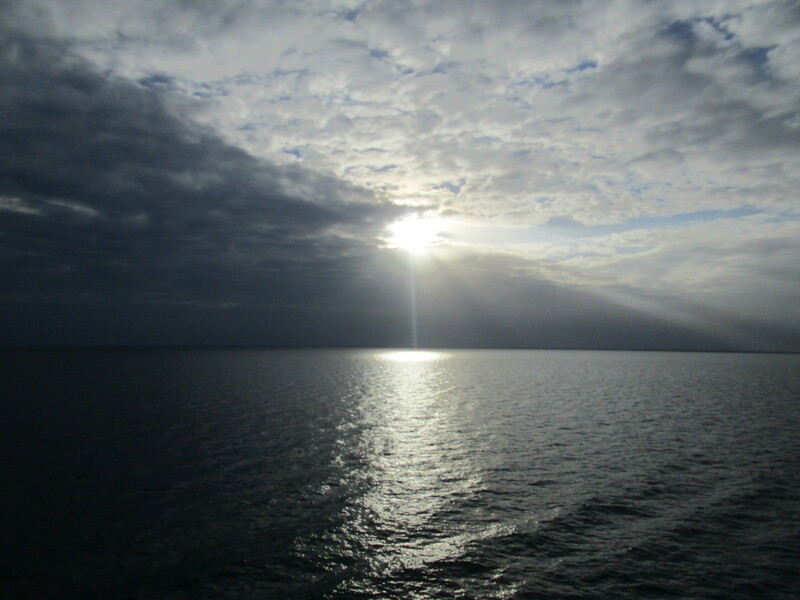 With the sun shining bright on the day of departure, we were off to a good start of our cruise. It didn’t take us too long to clear the lines at the check-in point. Checking in with NCL turned out to be a fast process, but we were a little surprised that we did not receive a map of our ship, even though we noticed some other passengers walking around with them. Strange, but not the end of the world, as we figured we would be able to get one on board. 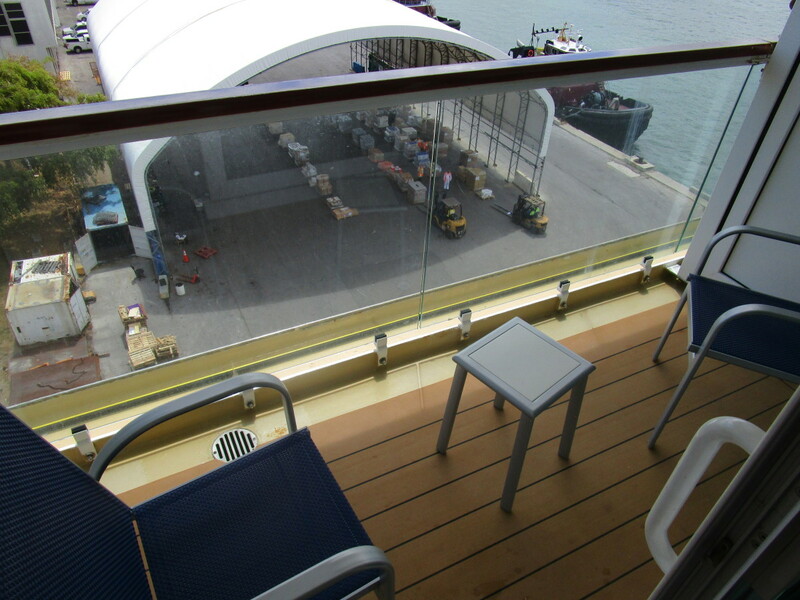 After receiving the keys of our stateroom, we had to wait a little while before we could board the ship. Nothing unusual, though it wasn’t very clear exactly where we had to go to wait. Fortunately, there was a lot of staff present, so we simply asked. We were delighted to notice that NCL had set up a drink station in the waiting area where you could get water and some other non-alcoholic beverages. 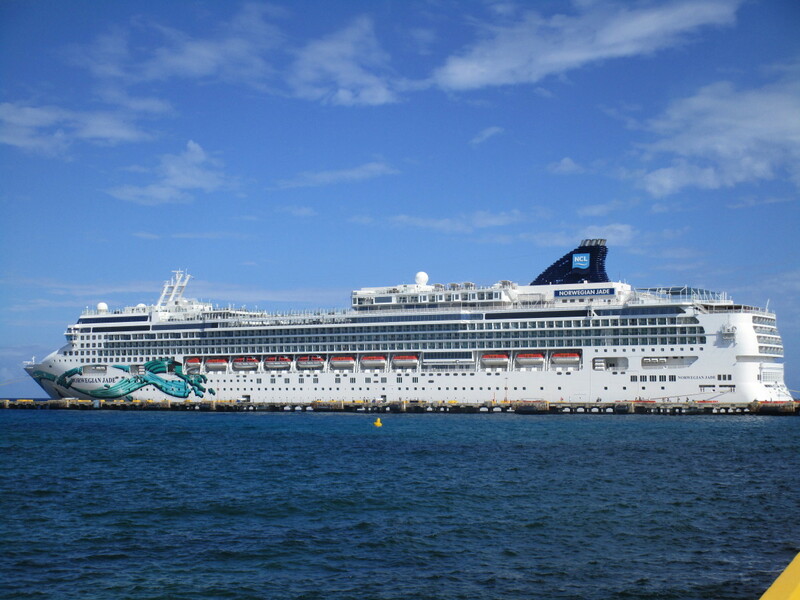 When the time finally came to board the Norwegian Jade, it became clear that the waiting area either had a broken announcement system or didn’t have one at all in the first place, as staff members put up their loudest voices to announce which boarding groups were up for embarkation. Not ideal, but they nevertheless somehow seemed to succeed in getting the job done that way. As soon as we set foot on the boat, we were greeted in a most friendly manner by crew members on several occasions. Fully aware that it was going to take a while before our staterooms would be ready, we decided to check out the buffet in the Garden Café. One could say this is some sort of widespread embarkation tradition among cruisers: as soon as you board the ship, you go eat. We were pleased to find out that the buffet was set up in various ‘food islands’, where passengers can walk around to load their plates. In our opinion, this kind of set-up is far more efficient than the straight-line kind of set-up that can be found on some other cruise ships, as it prevents you from standing in line for long amounts of time before you can get yourself some food. NCL must have recognized the importance of spreading the buffet traffic as much as possible, as we discovered that at the aft of the ship, there was a small extension of the buffet present. 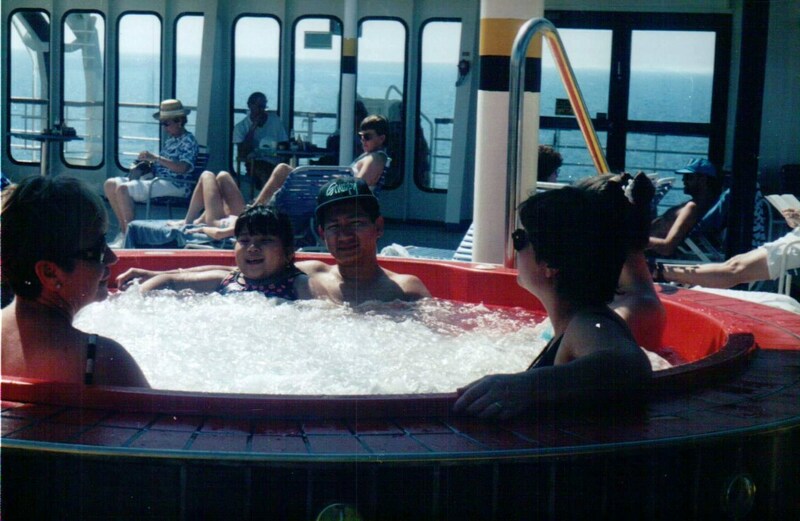 As a result of NCL’s efforts, we hardly ever had to stand in line for food at the buffet throughout our entire cruise. 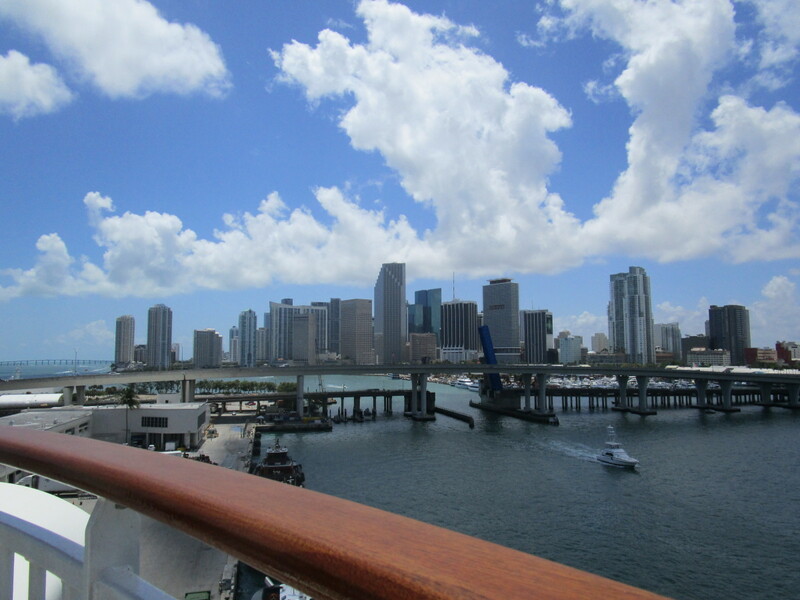 Soon enough, we found ourselves at a very nice spot at the aft of the ship, enjoying Miami’s great sunny weather and what turned out to be a delicious plate of food. It took a while before we could enter our stateroom. 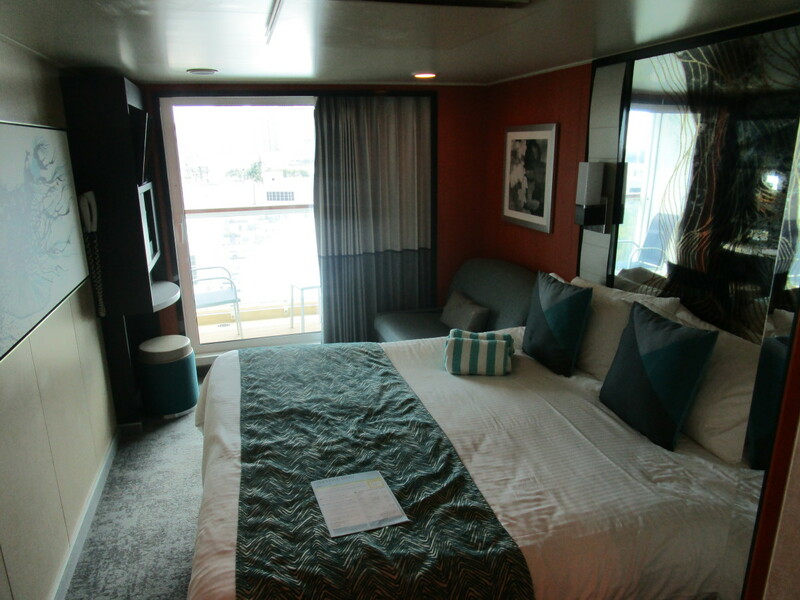 While conducting some research before our cruise, we encountered criticism in some reviews regarding the alleged below average size of NCL’s staterooms. Though we couldn’t entirely dismiss said criticism, we did not perceive our stateroom’s size to be detrimental in any way. Well, maybe except for the toilet space in the compartment-style bathroom, where my knees became very close friends with the wall over time. Much to our delight though, we found the shower to be more spacious than some of the showers we have experienced on previous cruises and our balcony offered more room than we initially expected. 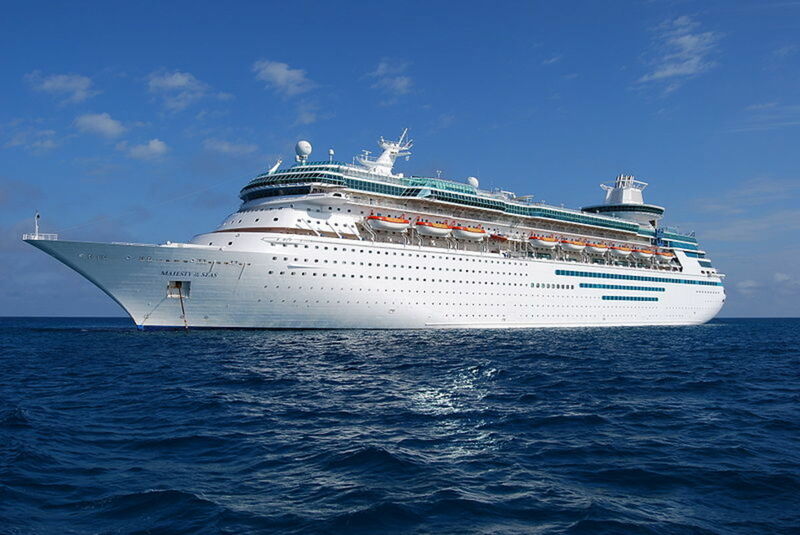 Days at sea on board of a cruise ship form an excellent opportunity to explore and enjoy the ship you’re sailing with and that’s exactly what we did on day 2. 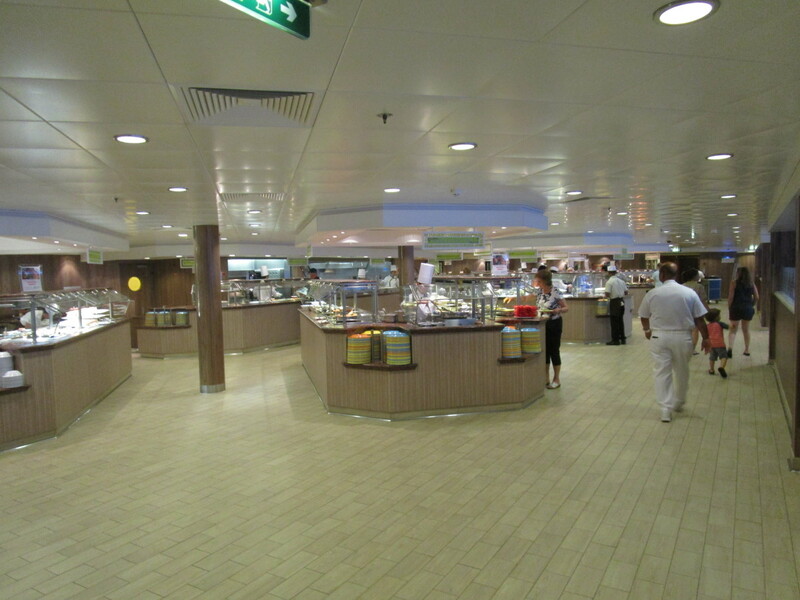 We noticed NCL’s attempts to spread its passengers over the whole ship were not limited to the buffet areas alone. If you felt like having lunch or dinner in the dining room, you had 2 options: the beautifully decorated Grand Pacific and Alizar, a more casual and informal main dining room. We noticed both dining rooms served the same courses. Smart move again on NCL’s part to have 2 main dining rooms, as passengers are given no fixed dinner time. As we have experienced on a previous cruise, flexible dinner times could easily turn into one big organizational disaster with dreadfully long waiting times. However, by having 2 main dining rooms as well as other restaurants where people can go without paying extra, NCL succeeded in tackling the problem before it could ever occur. 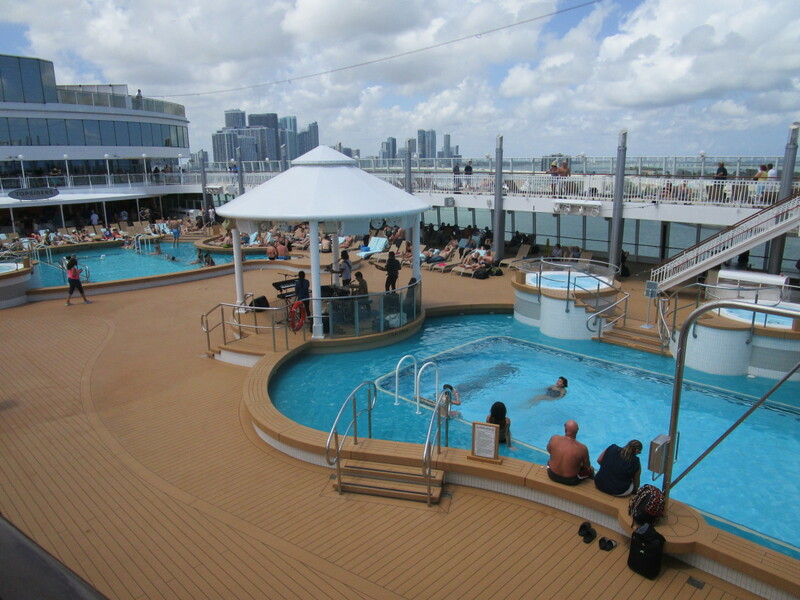 There were 2 pools on the pool deck: one for everyone and one for adults only. 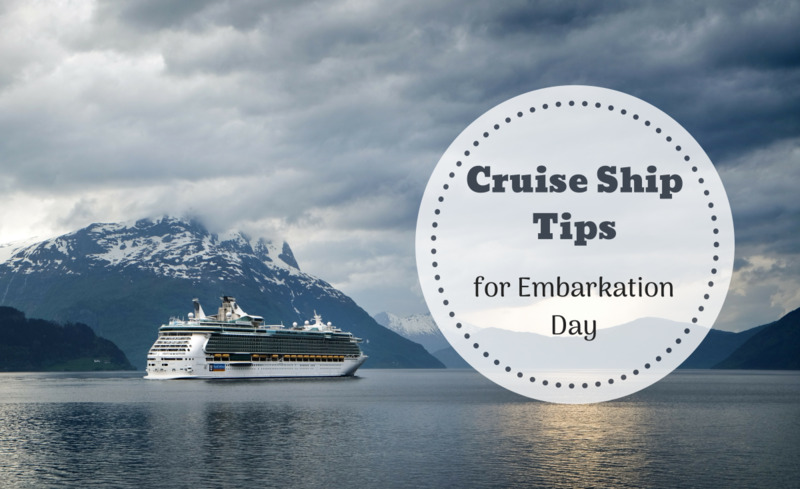 It was particularly difficult to get a seat or lounge chair during the afternoon, but unfortunately, this is a common problem on most sun-bound cruise ships during full days at sea, as lots of passengers want to enjoy the pools and the weather on these days. Nevertheless, having 2 pools certainly helped to spread the pool-traffic to a degree. Towards the end of day 2, the sky had turned ominous, eventually proving itself to be the omen of a pretty bad monsoon. 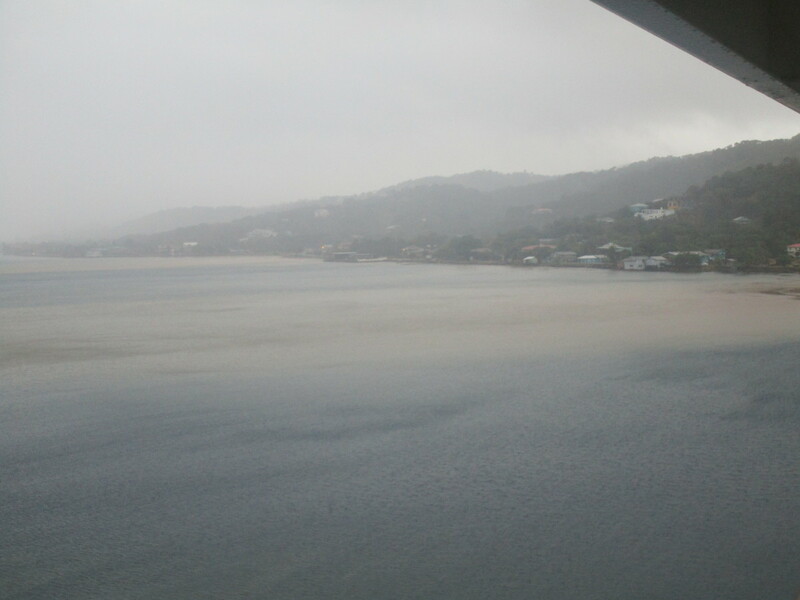 Sadly, the bad weather lasted all the way through day 3, when we were docked in Honduras. NCL rightfully decided to cancel the Tabyana Beach Party we had booked and we debated whether or not we should go off the ship. We did end up going in the end. Neither one of us had ever set foot in Honduras before and we were hopeful there would be something to see or do at the port. Unfortunately, this proved not to be the case. The port area turned out to be remarkably small. As is customary at cruise ports, there were some shops and a few places to buy a drink, but that about summed it up. As a result, we ended up spending perhaps a mere 15 minutes at the port before we decided to have the seemingly never-ending rain accompany us back to our ship. The weather on day 4 started out in a rather questionable fashion, with the sky being clouded. Luckily, it finally started to clear later that day, when we found ourselves at yet another location neither one of us had ever been before: NCL’s private island of Harvest Caye in Belize. 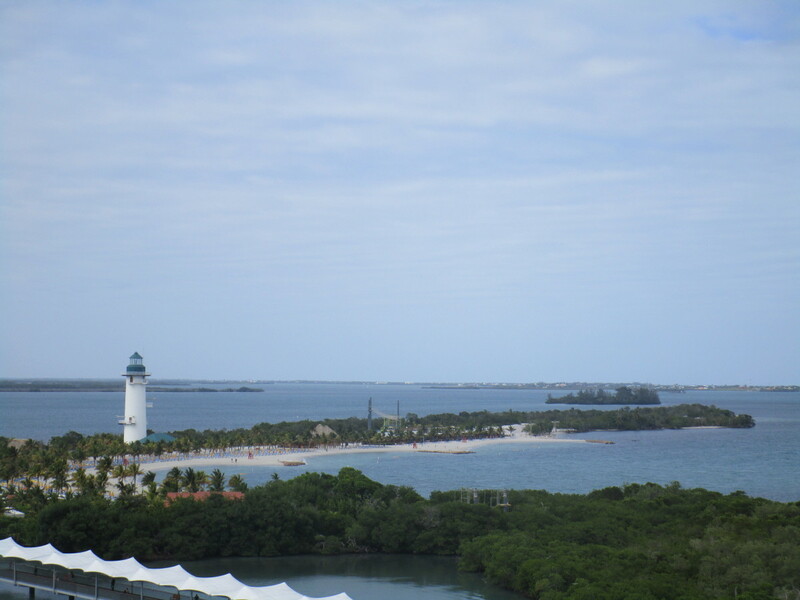 This island is so small that we were able to view it in its entirety from an upper deck of our cruise ship. A long, covered walkway enabled us to get on land. For those with disabilities, electric vehicles conveniently drove back and forth between the ship and the island. Several signs made the island easy to navigate. 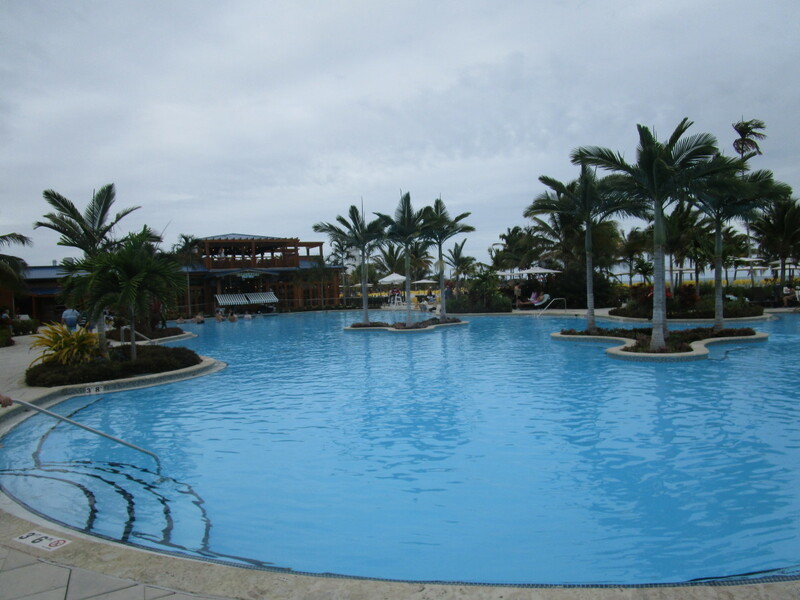 We quickly found a large and great looking pool on our way to the beach. As it turned out, the sand on said beach was not the greatest – as I particularly discovered while playing a few games of beach volleyball – but doable nevertheless. Our lounge chairs were included, thus further contributing to a very pleasant stay at this beautiful, palm tree-ridden tropical island, which also came with a restaurant and a zip line. There briefly was some excitement among those swimming in the ocean when a dolphin was spotted. Being a snorkeling enthusiast, I quickly got out of the water to get my snorkel gear, but unfortunately, the dolphin was never seen again. Maybe better next time. Speaking of snorkeling: the water here doesn’t lend itself too much for that. You may encounter a few small fish, but don’t expect a whole lot more. Once I had visited Mexico for the first time, I knew that I would always have a great time there whenever I would come back. 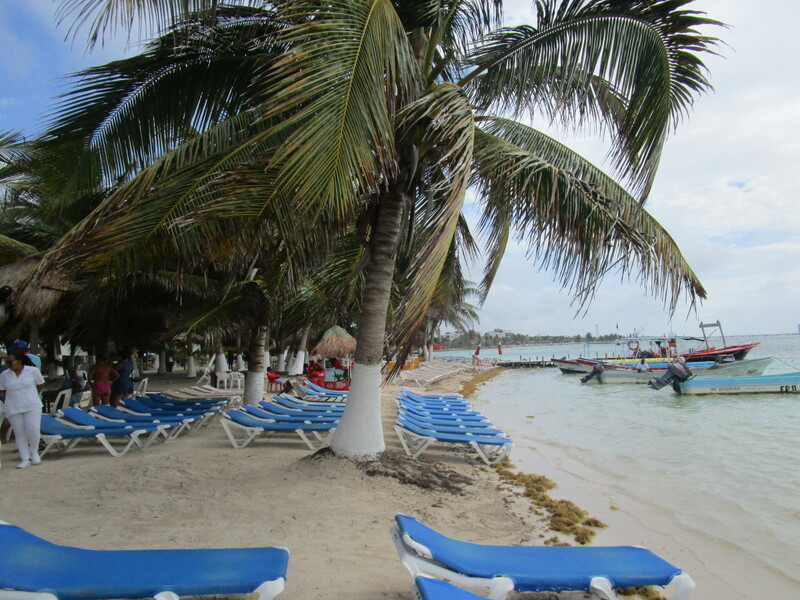 Needless to say, I was very much looking forward to arriving in Costa Maya, where we had booked a day at a private beach in the fishing village of Mahahual that also included a lunch, unlimited (alcoholic) beverages, and a 1-hour massage. We took a taxi from the port and arrived at our destination maybe 5 minutes later. When a guy came up to the taxi to open the door for my wife, I knew we were going to be in for a real treat. The beach was small but very quiet. We had fun with some vendors who frequently visited and seemed to be carrying similar merchandise. One of them jokingly advertised ‘cancer-free cigars’ and another ‘the best junk you can buy at the beach’. We did not find the vendors to be a real nuisance, as they did take ‘no’ for an answer, after which they would quickly move on. After having a perhaps very early tipsy turtle for a drink, we decided to get our massages. My masseuse was great and clearly knew what she was doing considering the fact that I felt like a blob of pudding by the time she was done. Rejuvenated, back we went to our lounge chairs on the beach for some more tropical relaxation. I decided to do some snorkeling, only to find out that there are better places to explore some sea bottoms. If anything, I got at least a refreshing swim out of it. We had a busy schedule on our day in Cozumel: a bus ride to the San Gervasio Mayan Ruins followed by a brief stay at a beach in a non-electrified part of the island. Our bus turned out to be old and rather beat up, but it did get the job done. 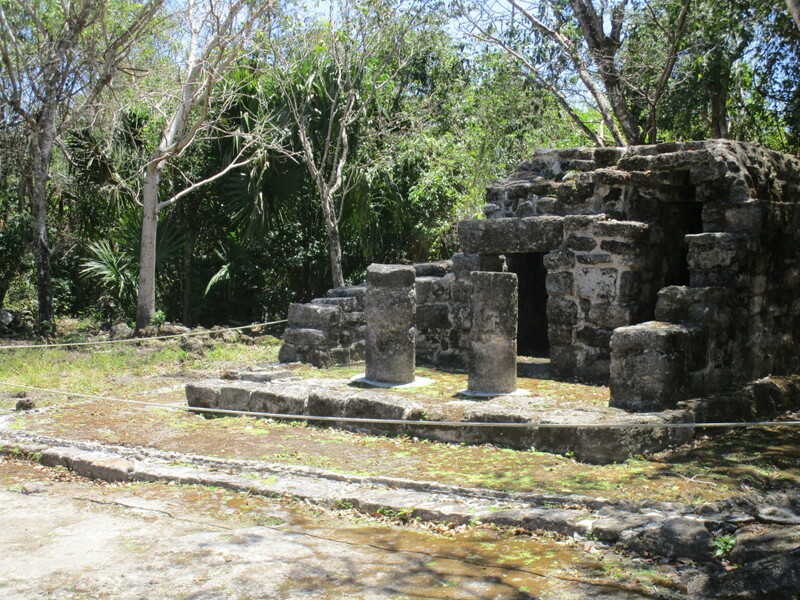 The Mayan Ruins were located all by themselves in the middle of the jungle (that more so resembled a forest). The area had been converted into a park with walkways, which made it easy to navigate through the many ancient structures present. I very much liked the fact that these were truly structures of an era long gone instead of replicas you may find elsewhere in Mexico. Certainly worth our while, particularly thanks to a knowledgeable guide. 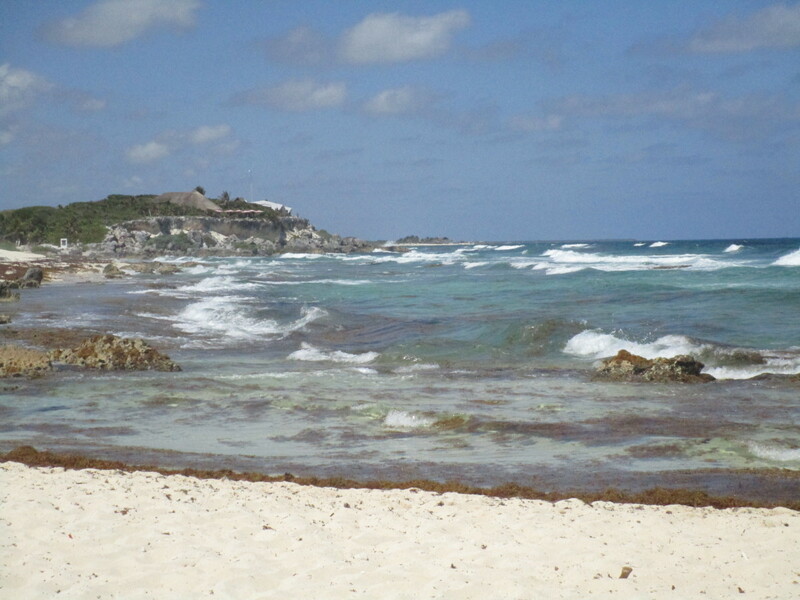 The day ended at a rather odd yet interesting looking beach situated in the non-electrified part of Cozumel. There were two directions in which you were able to get into the water. I noticed large differences in current strengths over a distance of maybe 150 yards, so be careful if you’re not a strong swimmer. 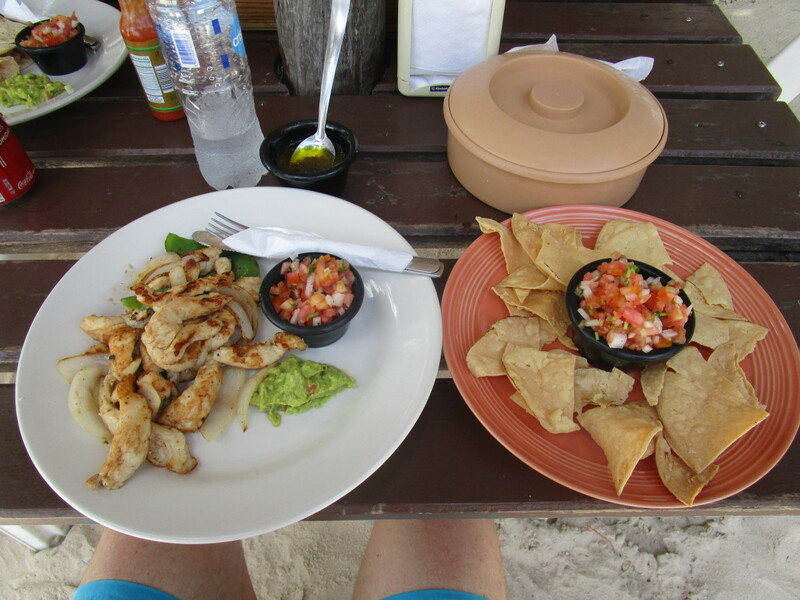 A couple of restaurants nearby served delicious, authentic Mexican food. When eating here, keep in mind it may take a little longer for the food to be served since they do not have electricity here as pointed out earlier in this article. My wife and I both agree that it’s always good to have a full day at sea before the cruise comes to an end, as it enables you to have a sit-back-and-relax-day before you go home. Not to mention the fact that it gives you the opportunity to pack your suitcases without having to rush. 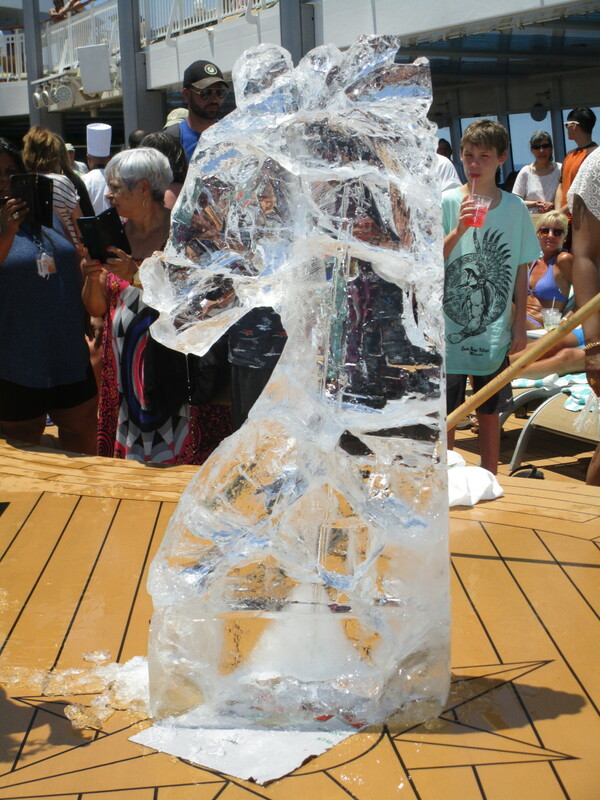 We enjoyed some more shows (I’m still not sure how the ice-sculptor managed to carve the head of a horse out of a large chunk of melting ice in the sun), food, and drinks while taking in just a little more tropical sunshine. NCL has the easiest disembarkation process I have ever experienced so far. This is the cruise line one more time accentuating its concept of Freestyle Cruising. To a degree, you actually get to pick a time slot for your disembarkation. You were given the choice between either disembarking very early in the morning, in which case you brought your own suitcases with you right away, or disembarking the conventional way, in which case you put your suitcases out in front of the door of your stateroom so they could be picked up by the staff and dropped off in the terminal the next day. We picked the second option and did not regret doing so. Lines cleared quickly and once the time had come for us to bid the Norwegian Jade farewell, we were back in the terminal in no-time, where our suitcases were already waiting for us. Our trip ended with a smooth bus ride we booked through NCL to the airport. 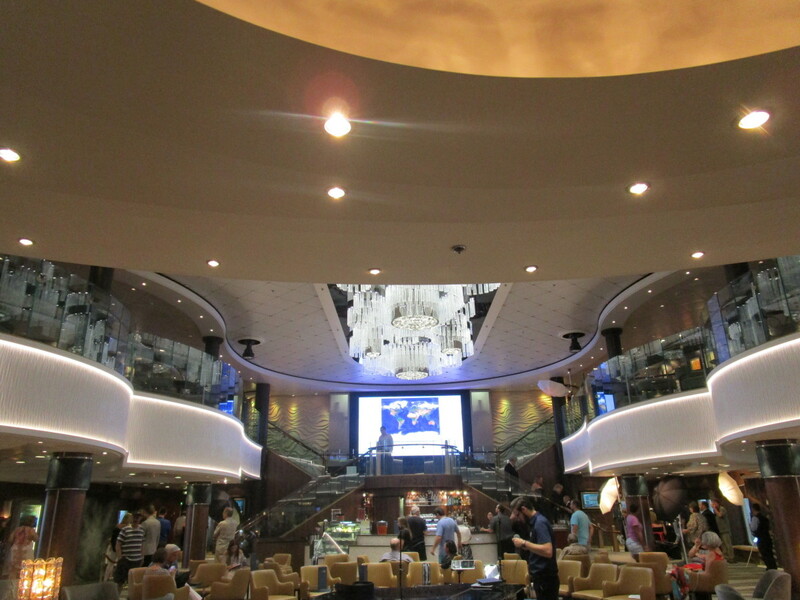 Was NCL the Right Cruise for Us? So was NCL’s concept of Freestyle Cruising for us? Most definitely! 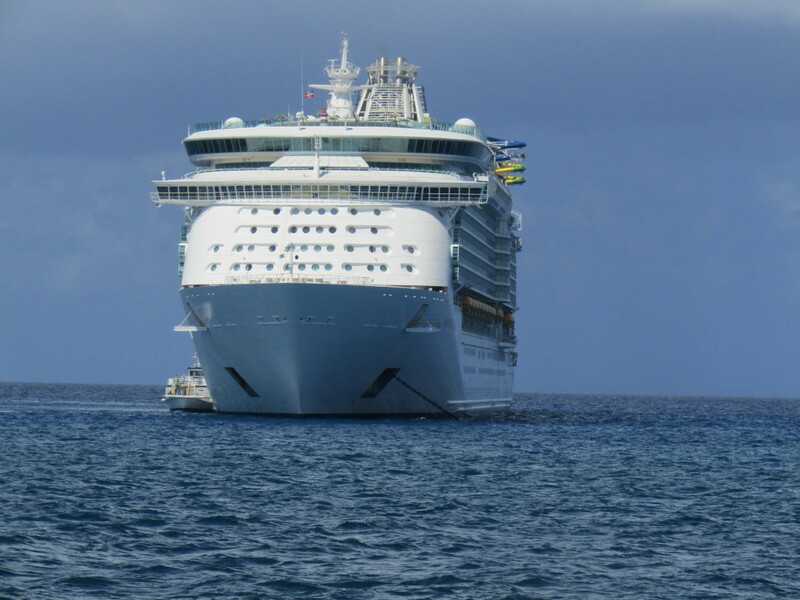 We very much liked the freedom it gave us to do this cruise as much on our own terms as possible. 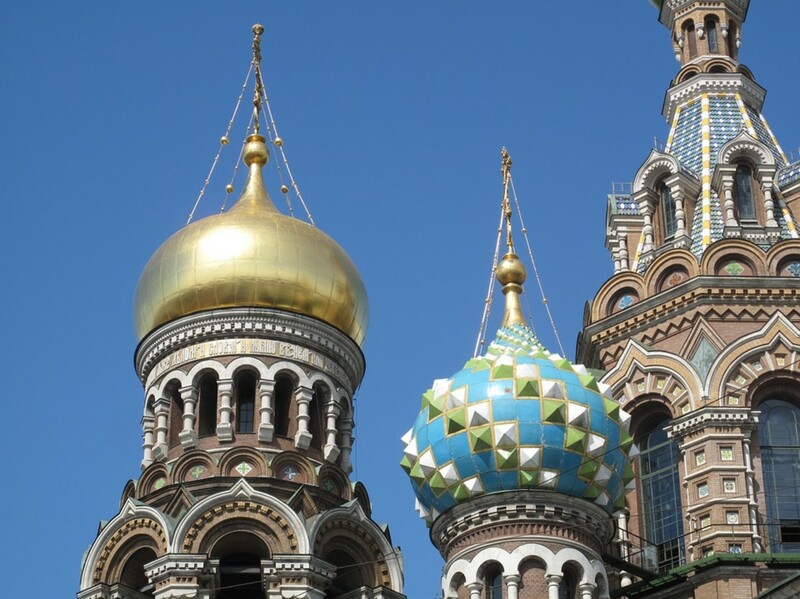 The staff was generally speaking amazing without being intrusive (other than perhaps our stateroom attendant who basically did a nice job, but tended to be rather overzealous). 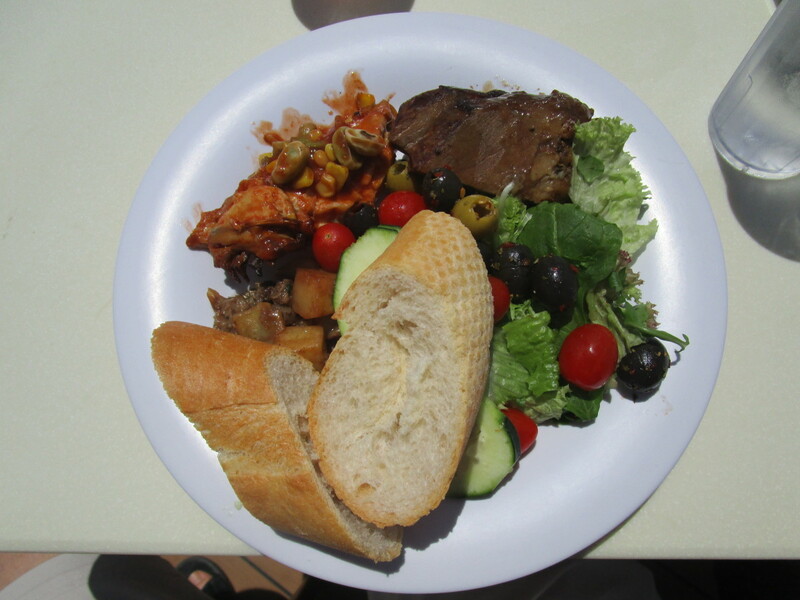 The meals in the main dining rooms didn’t score much above mediocre, but luckily the many different kinds of food at the buffet truly rocked! We enjoyed many of the entertainment options that were available in abundance. No complaints either regarding the ship’s cleanliness – we witnessed firsthand how staff members were continuously busy cleaning. As far as the ship itself is concerned: even though it is not the prettiest vessel I have ever sailed with, it certainly has some really nice looking areas and a welcoming feel to it. 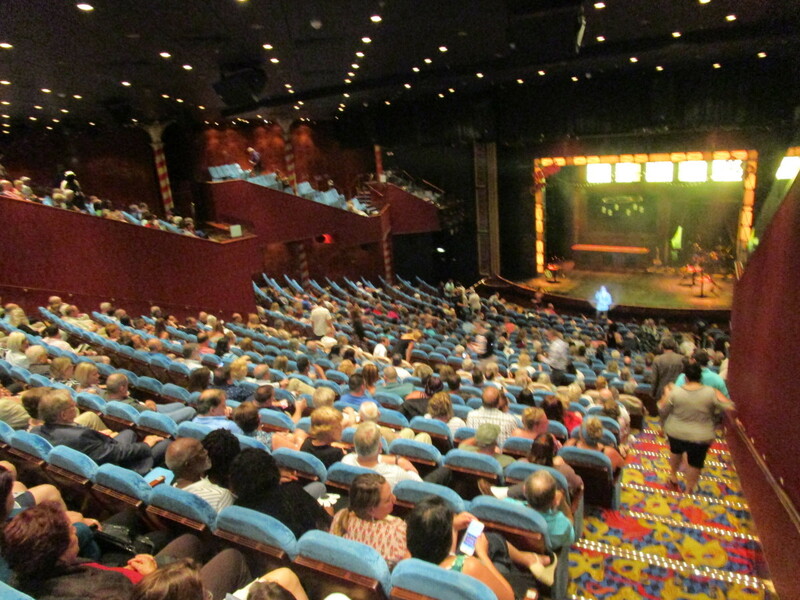 I was particularly impressed with the Pacific Dining Room as well as the theater where we became frequent guests. 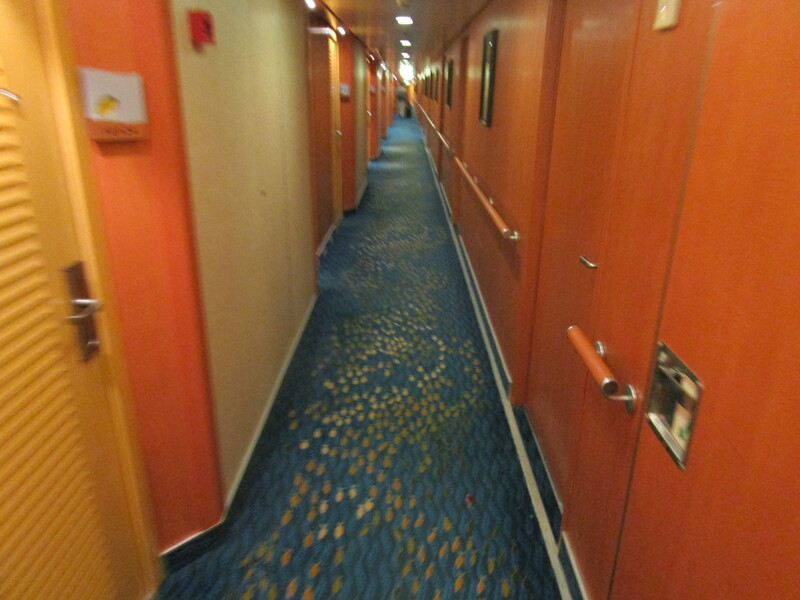 Lastly, I’d like to bring up the carpet in the corridors on the decks where the staterooms were situated. This carpet has a print of small fish that looks nice, but I didn’t think too much of it at first. Until I found out that the fish are actually there to aid the passengers in navigating the ship: they are always swimming forward, to the front of the ship…Genius. 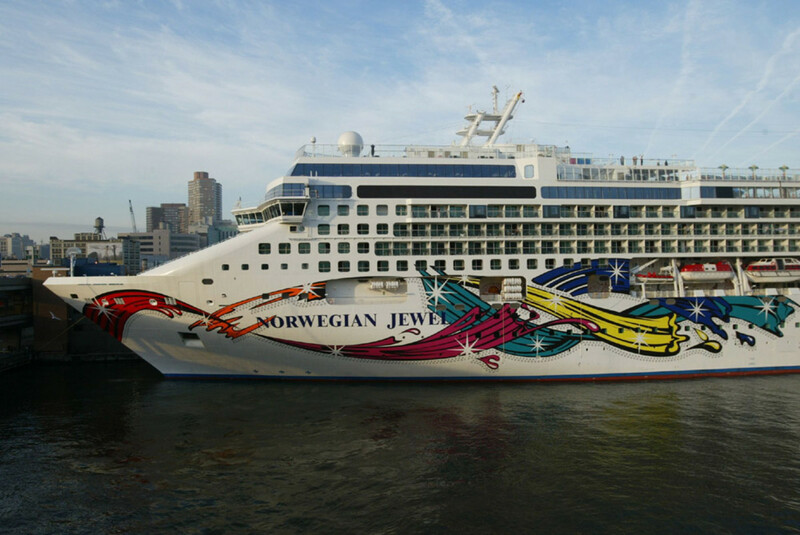 Is Cruise Ship Art Valuable?